At some point in your Aussie travels, you'll want to head away from the beach towards the outback. If you're around the Brisbane/Gold Coast Area, there are two amazing National Parks that offer classic unusual outback terrain and it can all be done in a matter of three days. So pack up your rigs and get ready to head into the outback territory on the Queensland/New South Wales border. Day 1: Driving out to Giraween takes anywhere from 3:30 min to 4 hours depending on where your coming from. If you're into wine you can stop by an array of wineries in the Stanthorpe region before entering the park. There are two campgrounds available in Girraween - Bald Rock Creek and Castle Rock, both are pretty much the same. You can stay at either spot and access the park. There are tons of day hikes inside the park. We would recommend hiking to the natural bridge and onto the Pyramid summit where you will find an amazing balancing granite boulder. Another great hike is to Castle Rock, where you can get killer views of the entire area. Girraween is known for it's granite rock formations and I recommend taking some time to walk the tracks and marvel at how some of these rocks even exist in the middle of the outback. Take an evening stroll around the park and you will definitely come across plenty of kangaroo. Day 2: Wake up and if your feeling up to it, take a morning stroll and boulder around the granite, or have a cuppa and be on your way. The drive from Girraween to Bald Rock is not very far. If you're low on gas, I recommend hitting up Tenterfield for fuel and supplies for your next evening. The camping grounds are just right at the base of Bald Rock. Find a good spot, set up, and explore the area. 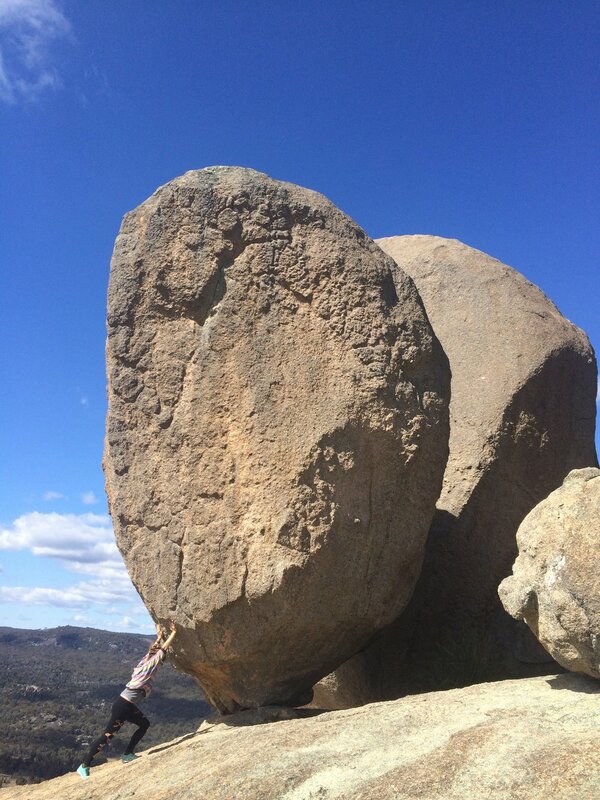 Bald Rock is Australia's biggest Granite monolith and it's an amazing rock to scramble up. There is also an amazing old growth gum forest at the base of this monolith. This park is seldom visited. So, don't be surprised if you only see a few other campers/hikers around. We recommend catching the sunset over the outback from the summit. Day 3: Set your alarm about one hour before sunrise get your headlight on and start the predawn summit up Bald Rock face. If weather permits you will witness an amazing sunrise over a sprawl of gum and eucalyptus forest below. Enjoy the solitude from this amazing rock and even take your shoes off for some of the best earthing in Australia. After you're satisfied, head down, chill out at camp, and get ready to pack up and head out. You can wrap the trip up by taking the B-60 to the A-1 and head north a bit into Byron Bay which is easily Australia's most iconic beach town. Check out our Byron guide here.